Bottom Line: The Ultra X-Finity 600W has a nice blue glow, is this the bad boy PSU for you? I'm back with another Ultra power supply. As if 500W wasn't enough, today I'm reviewing the 600W. What's another 100W? Well this power supply is leaps and bounds different than it's 500W cousin. The X-Finity 600W is actually two 300W power supplies placed on top of each other. Loads of power AND good looks. You can see how the side windows react to UV light. The X-Finity 600W doesn't feature modular cables. In fact, Ultra claims that there just isn't enough room inside for the modular interface. 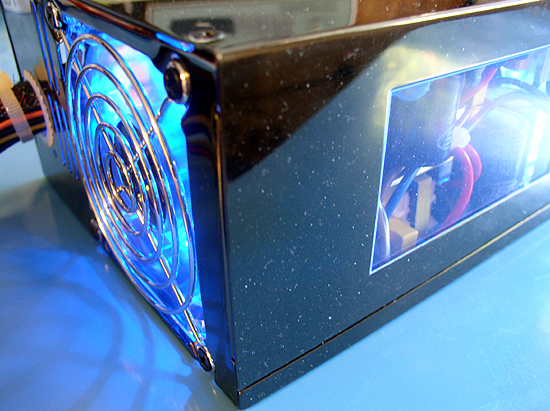 The X-Finity does feature two blue LED fans and a window on each side. The windows expose this power supply's soul: Two 300W power supplies stacked on top of one another. One power supply supplies only 12V and -12V. The other power supply supplies the 3.3V, 5V and -5V. The two are linked with a couple modular cables just prior to the harness that finds it's way out of the back of the housing. The finish is a titanium finish similar to that of Ultra's other power supplies. It's very shiny and requires a good polishing after you fondle it.